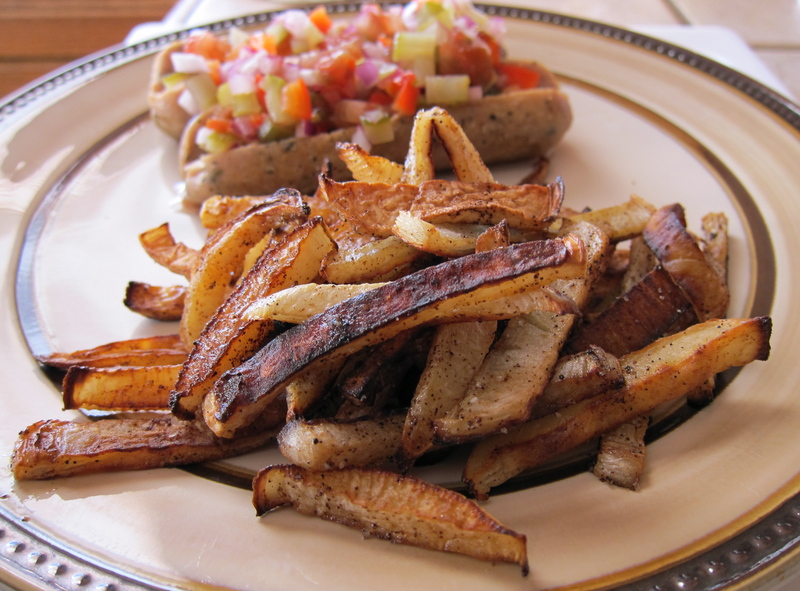 Crispy Delicata Squash Fries…so tasty. Winter squash seem to be EVERYWHERE these days and I couldn’t be happier! This is a super easy and quick recipe that makes a comforting side dish for any meal…I love to roast pretty much any squash but I especially like the Delicata since the skin is edible, no peeling necessary!!! 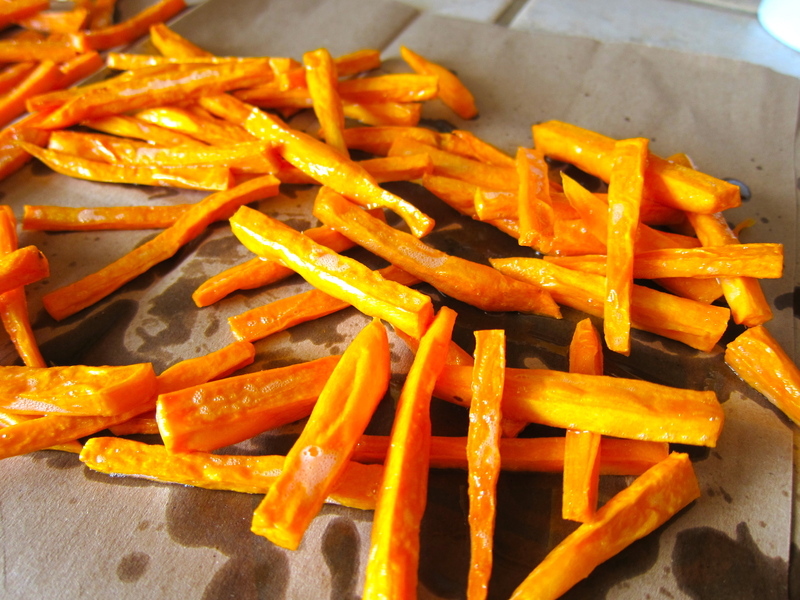 Preheat oven to 425 degrees F. Line a large rimmed baking sheet with parchment paper. With a sharp knife cut squash in half and remove the seeds. 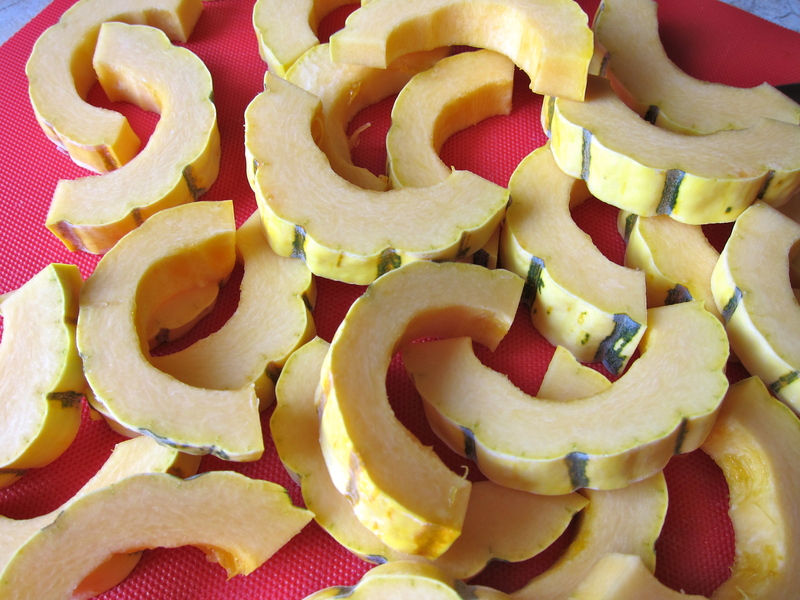 Slice the squash into 1/4″ pieces. 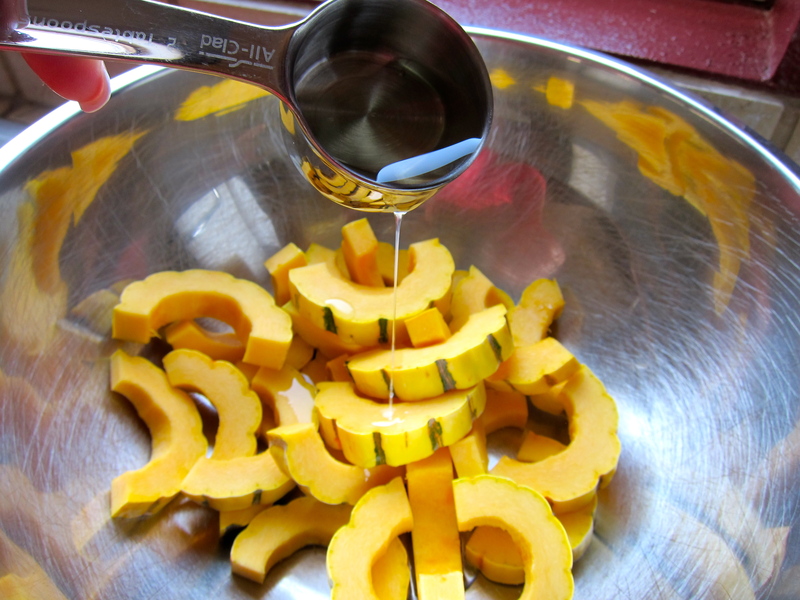 Place squash in a large mixing bowl and toss with coconut oil and salt and pepper to coat. 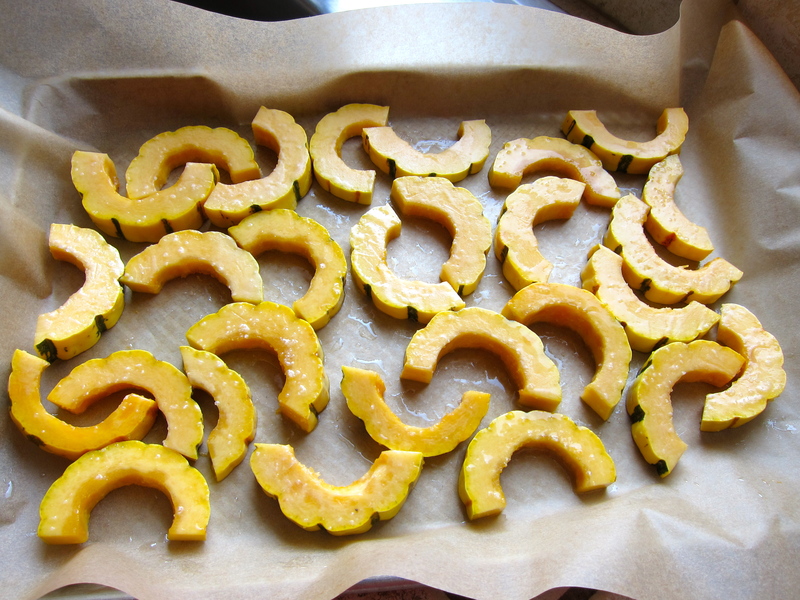 Place coated squash on the parchment lined baking sheet. 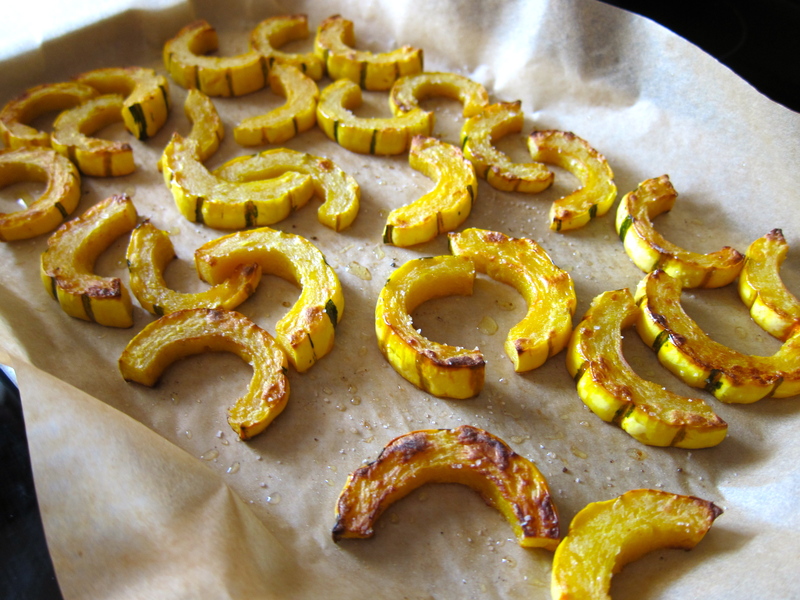 Bake for 30 minutes, turning all the squash halfway through baking. 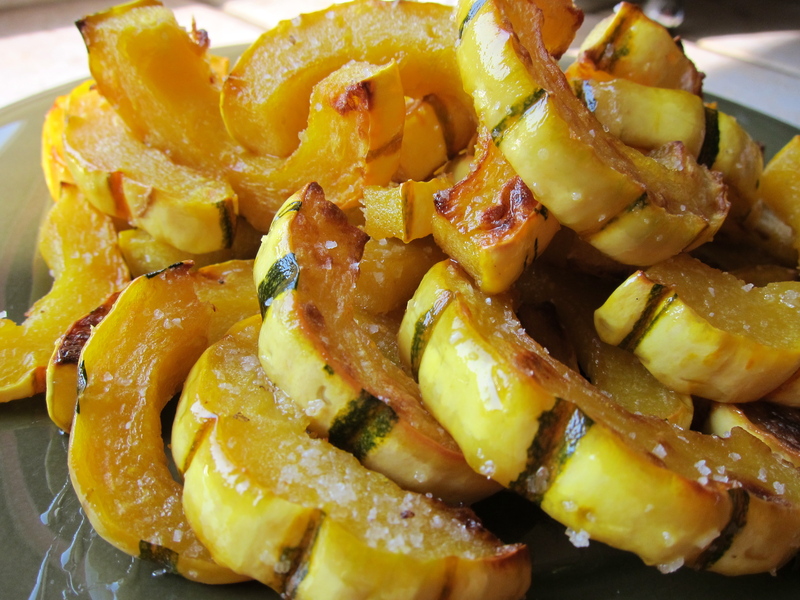 Once the squash is browned and crispy, remove from oven and sprinkle with sea salt. Serve immediately. 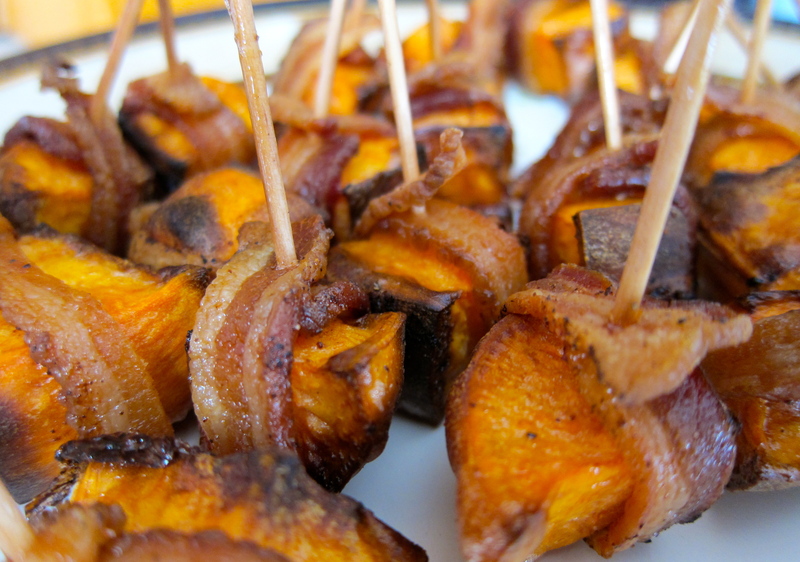 Bacon Wrapped Sweet Potato Bites…Oh, Yes I Did! 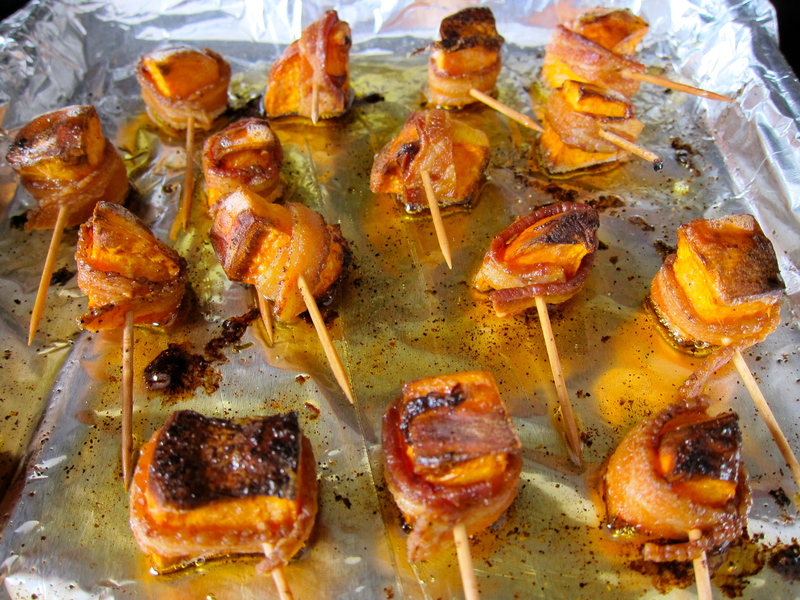 Bacon Wrapped Sweet Potatoes…Could there be anything better? Really, does anything more need to be said? 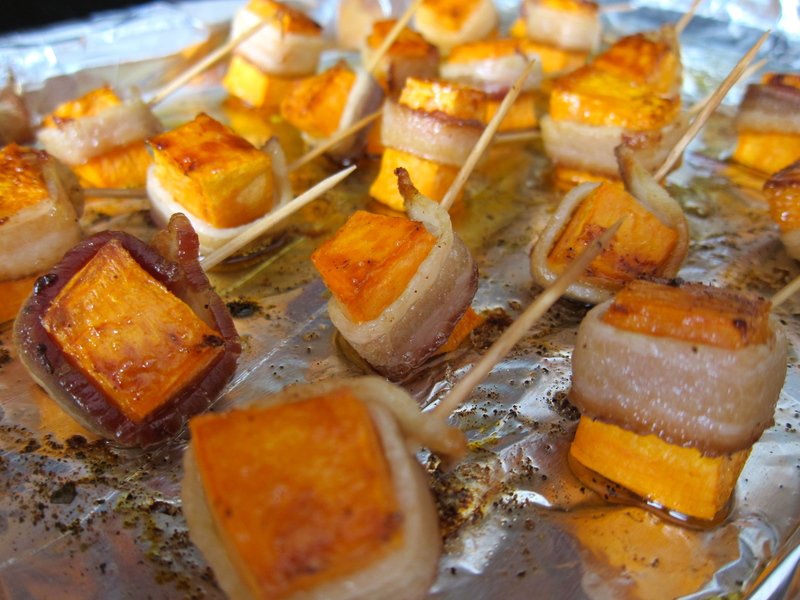 Seems like everything just tastes better wrapped in bacon…dates, jalapenos, asparagus, scallops, filet Mignon…I’ve tried them all, why not sweet potatoes? This lovely little bit of heaven did not disappoint! 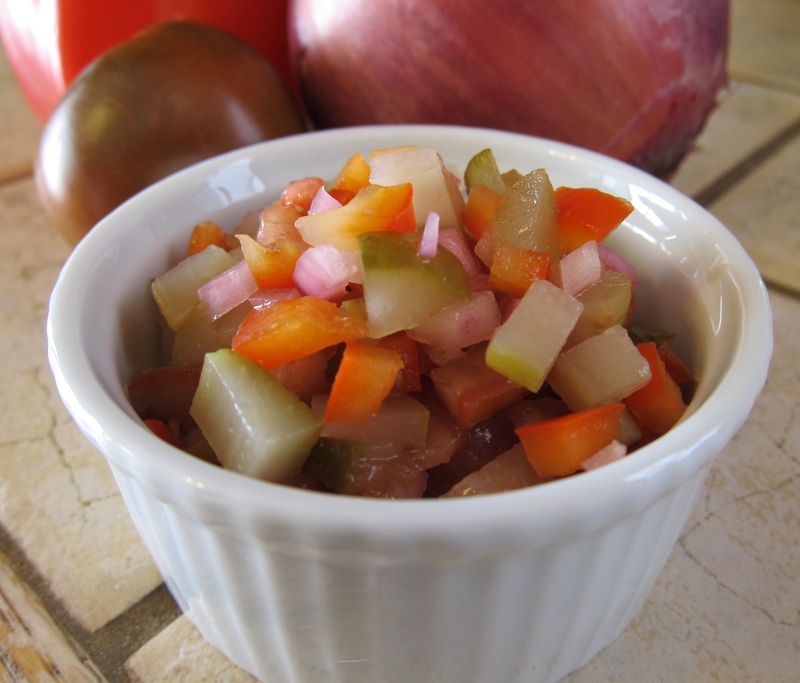 Great as an appetizer, side dish or even a light meal with a salad! Preheat oven to 400 degrees F. Line a rimmed baking pan with foil or parchment paper. 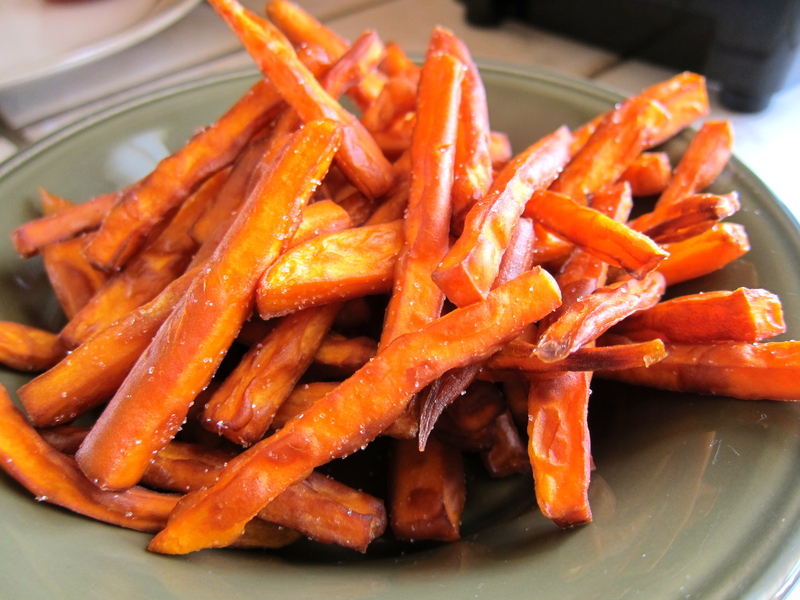 Cut the sweet potato into 1″ chunks. Slice the bacon in half crosswise and then lengthwise to yield 16-24 strips, use enough bacon to have one strip per sweet potato chunk. 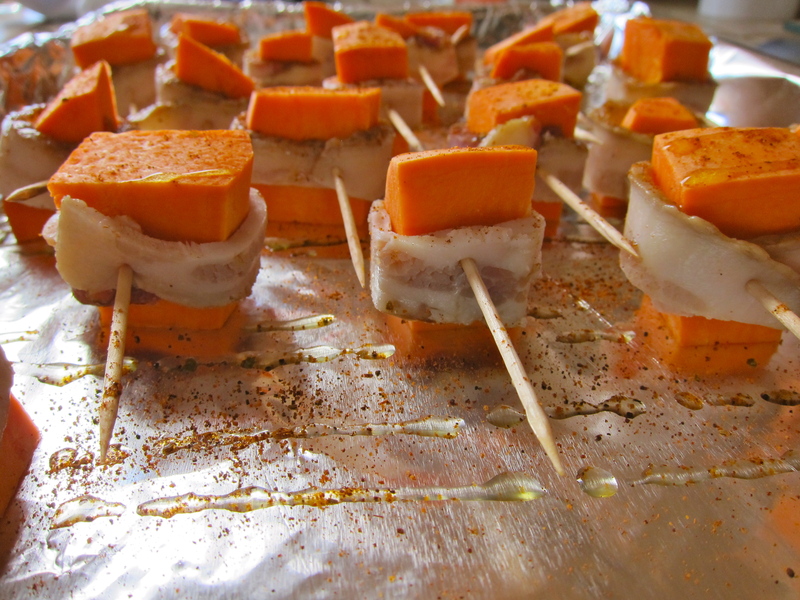 Wrap each sweet potato chunk with a strip of bacon and secure with a tooth pick, place on baking pan. Drizzle with olive oil and sprinkle with chili powder. Bake for 20 minutes, remove from the oven and flip over. 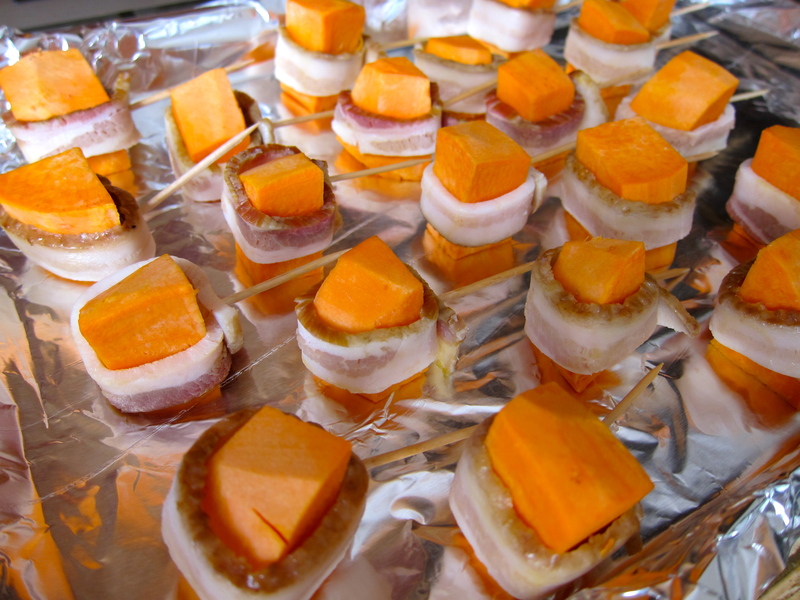 Place back in the oven for an additional 20-25 minutes, until the bacon is crispy and sweet potatoes are browned. Remove to paper towel lined plate until ready for serving. These are best served warm with sour cream (if you eat dairy), homemade ranch or guacamole for dipping. Asparagus. Bacon. Need I say more? Preheat oven to 400 degrees F. Trim stalky ends off the asparagus, wash and pat dry. Lightly coat asparagus in olive oil and season with salt and pepper. 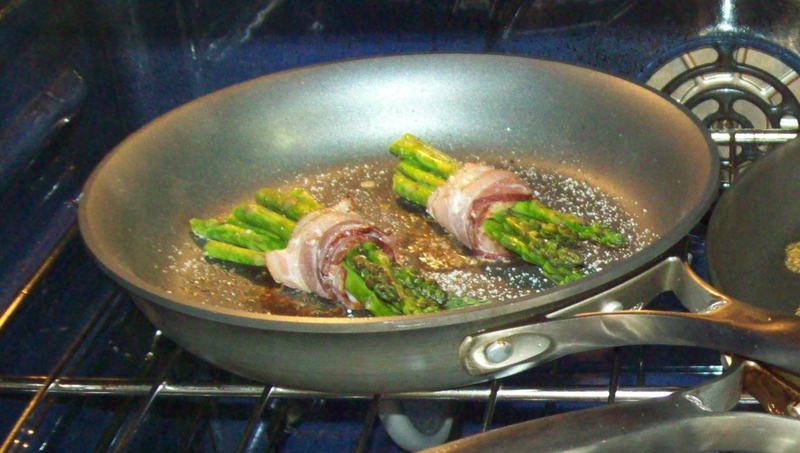 Wrap 6 – 8 stalks of asparagus with one slice of bacon and place bundle on a broiler or sheet pan, repeat with remaining asparagus and bacon. Bake for 12-14 minutes, turning bundles once halfway through. Bacon should be crisp and asparagus tender. ***Asparagus can also be cooked on a hot grill…place bundles directly on grill and cover, cook 10-12 minutes. 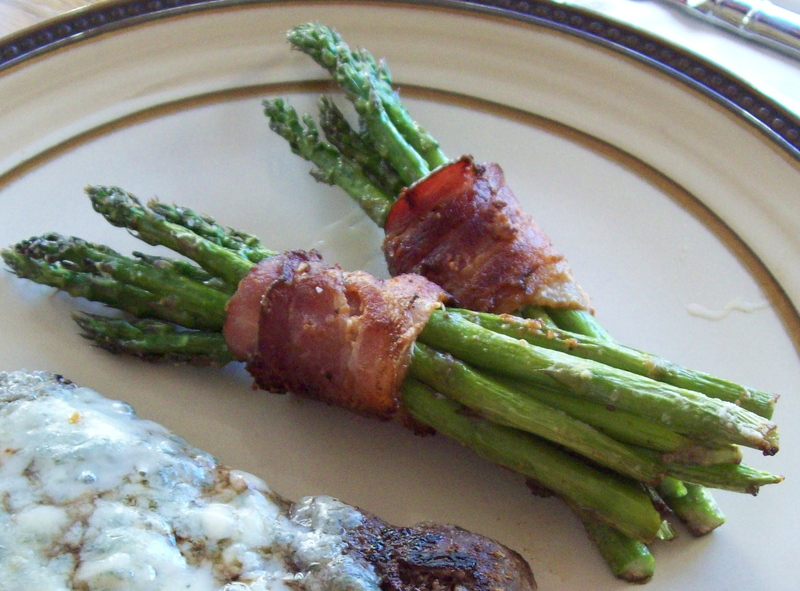 ***If your asparagus bundles won’t hold together secure bacon with a toothpick or kitchen twine. I used an oven proof pan this time...worked beautifully. 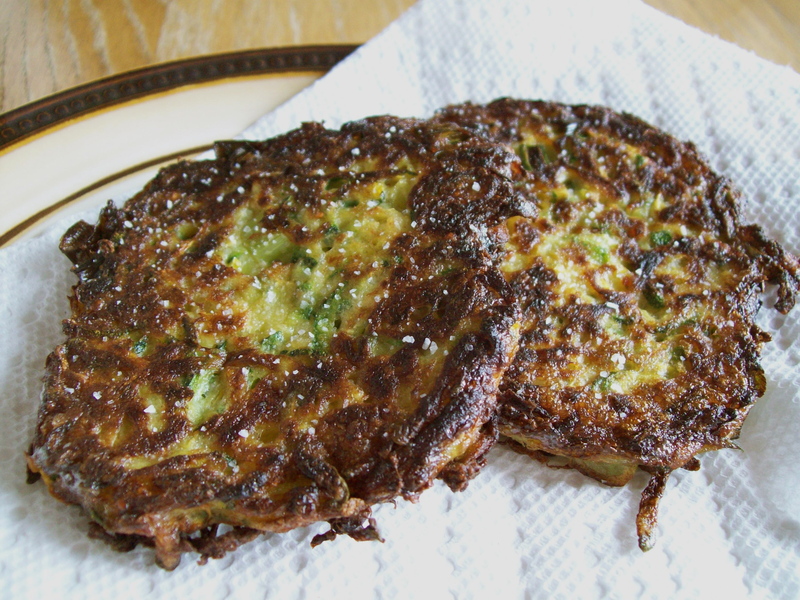 Traditionally, a latke is a potato pancake. 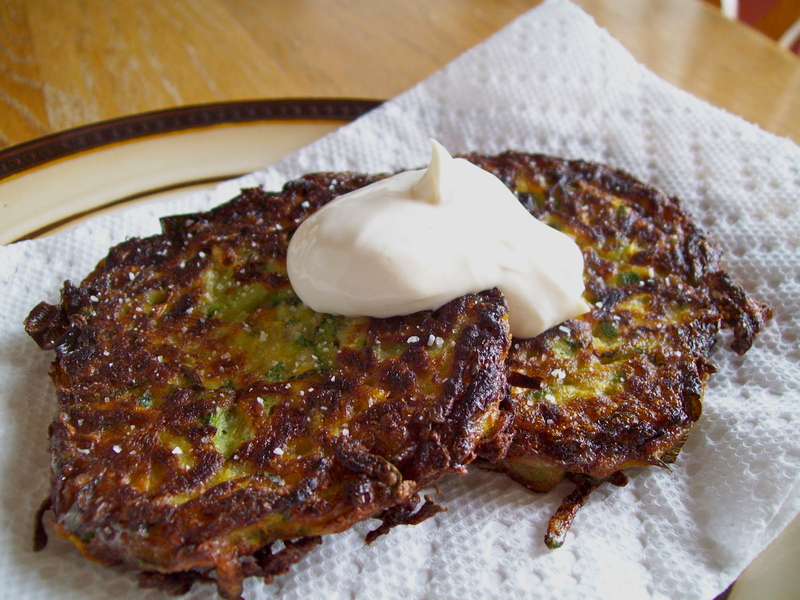 Most people think of the potato pancake as a Jewish dish eaten during Hanukkah, but potato pancakes of some sort exist in potato-eating cultures around the world. My first experience with a potato pancake was at a block party in Allen, Texas…all my neighbors got together one fall evening with a few coolers of beer, several bags of potatoes, a tub of Crisco and all our Coleman camping stoves lined up in the cul-de-sac…a few hours later (and a couple refills of the beer coolers!) I had my first potato pancake. I couldn’t imagine how I had gotten into my early twenties living in the south and never had one of these little bites of heaven, crispy outside, fluffy & salty inside, doused in ketchup…oh my I was hooked! Needless to say those potato pancakes were terribly unhealthy and were full of processed “white” food and hydrogenated oil…AND to this very day (about 15 years later) there is still massive Crisco oil stains on the driveways where we fried them!!!!! Fast forward to the present day into my gluten-free, grain-free, unprocessed and refined sugar-free lifestyle…I still love to re-create the tastes and textures of the foods I loved back then. For years I have been making a wonderful sweet potato latke but lately have been experimenting using less starchy vegetables with really great results. 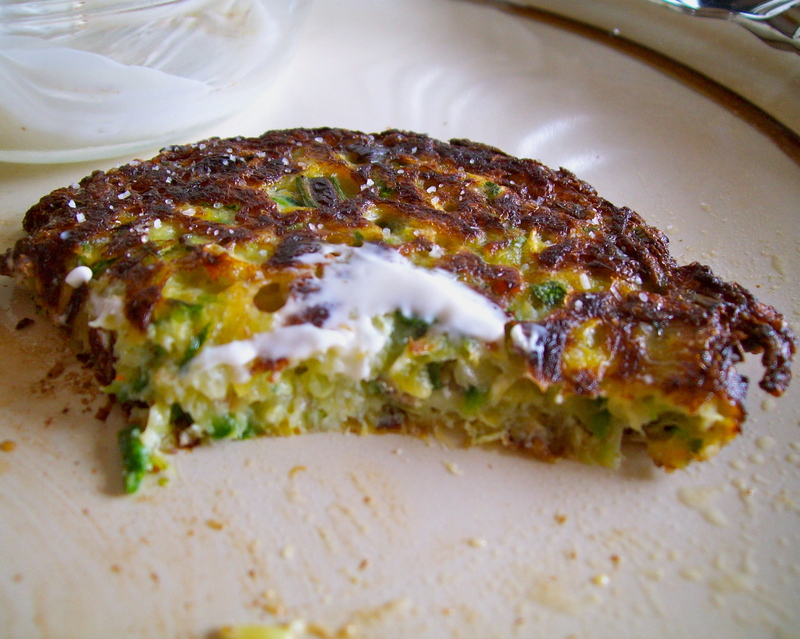 My favorites are these summer squash and zucchini latkes followed closely by a jicama and carrot combination. Once again, this recipe is easily adaptable with just about any vegetable, the key is to squeeze as much moisture out of the grated vegetables you are using so the latkes don’t get mushy. 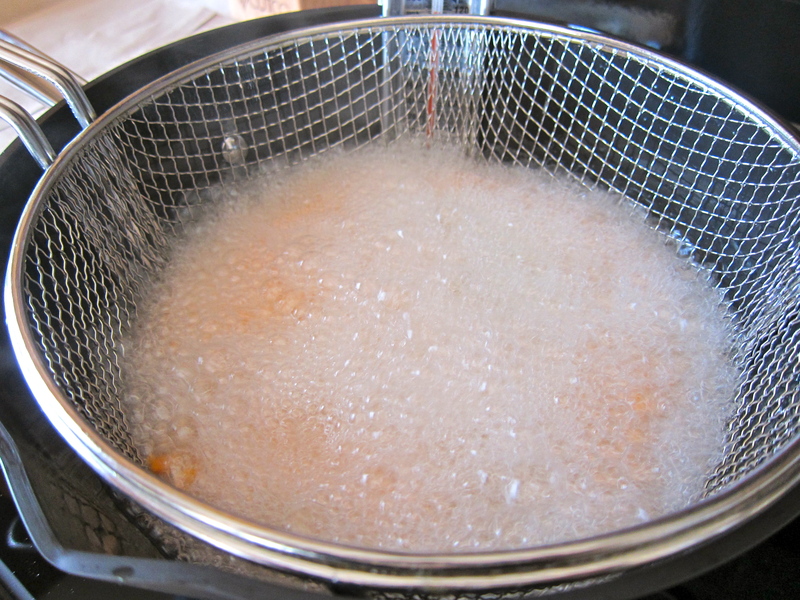 Heat oil in a large skillet over medium high heat. Grate squash and zucchini on a box grater or in a food processor and place in a medium bowl. 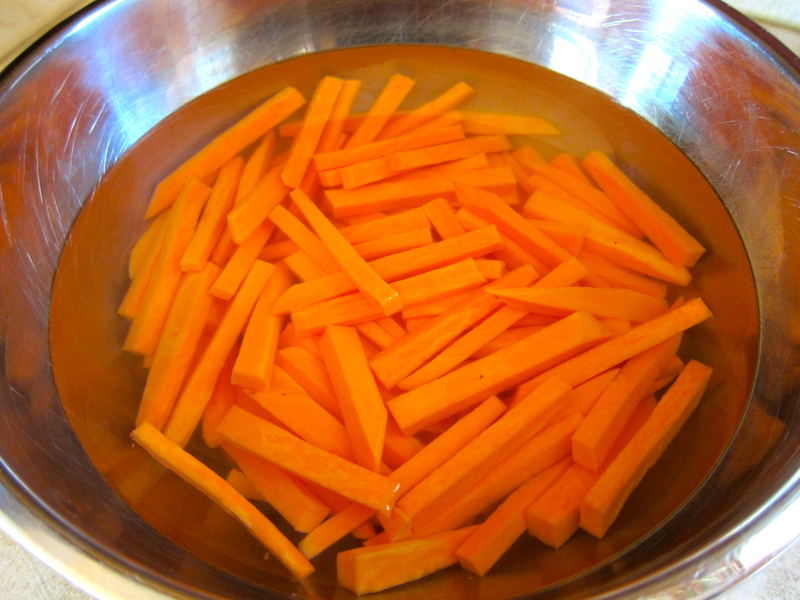 Sprinkle a generous amount of salt over the squash and mix together, let sit in the bowl for about 15 minutes. Scoop the squash mixture into a clean kitchen towel and squeeze out all the excess moisture (this is the most important step of the process, so don’t skip it!). Place the drained squash back into the bowl, add green onion, beaten eggs, salt and pepper to your taste and crushed red pepper, thoroughly combine. 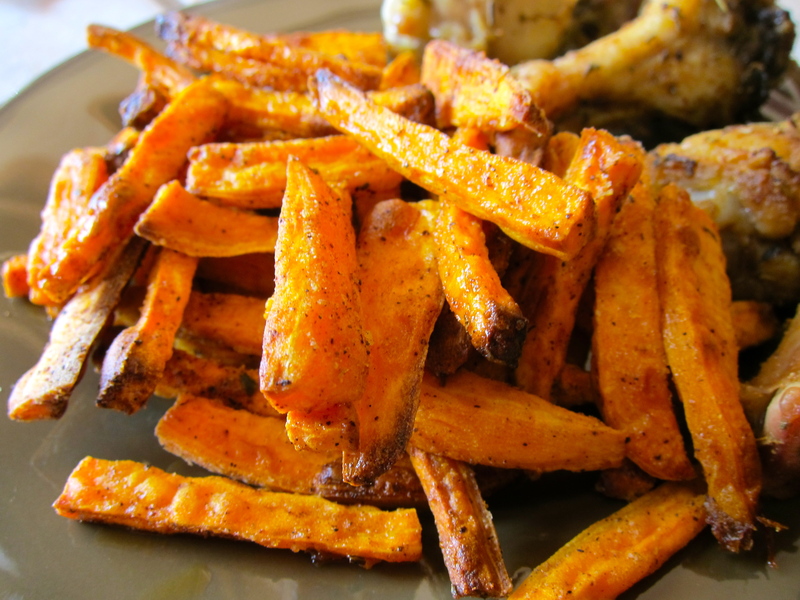 Drop about 1/4 cup of the squash mixture into the hot oil and slightly press down with a spatula, fry until slightly browned and crispy on each side, usually about 5 minutes per side. 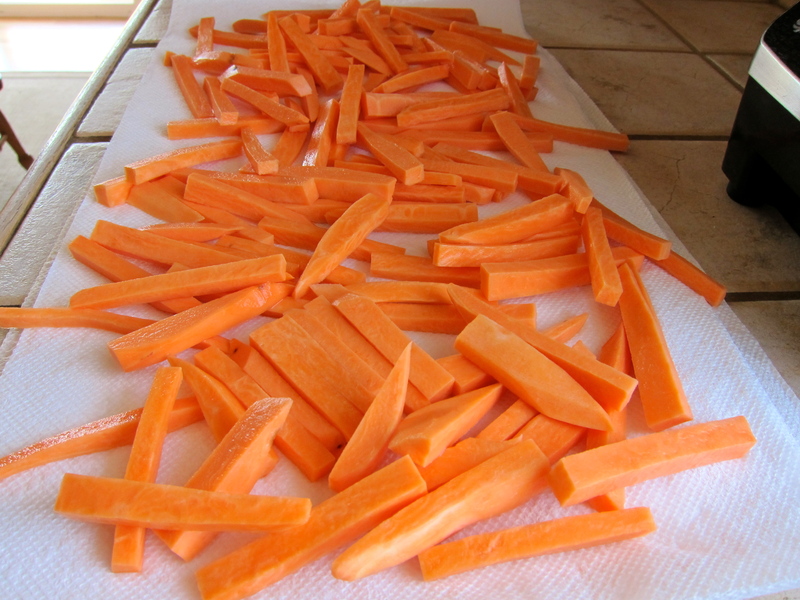 Remove from oil and drain on paper towels. Serve warm or at room temperature with a dollop of fresh sour cream. Super crispy on the outside, moist but not mushy on the inside. Squeeze as much moisture out as you can!